If your skin needs that extra bit of moisture with a natural scent while you shower then a moisturizing shower wash is the best solution. The Tree Hut’s new Olive & Shea Moisturizing Shower Wash- Vanilla Spice is an in-shower moisturizing wash that leaves your skin clean, moisturized, and smelling amazing well after use. Using the Olive & Shea Moisturizing Shower Wash left my skin feeling soft and moisturized in the shower and out of it. The added olive oil and shea butter aided in the moisture and helped make my skin feel smooth and hydrated. The shower wash gave off a lovely vanilla spice scent that left my skin smelling fresh. The vanilla spice was derived from a natural vanilla extract. The vanilla smelled like natural vanilla on my skin and was pleasing to smell. The scent was not overwhelming and didn’t linger in the air. The Olive & Shea Moisturizing Wash came out smoothly and with a rich, clear consistency. It lathered very well when used with a shower mesh and a little went a long way. All I needed was a small amount of the shower wash to lather up my whole body. It was a gentle wash that was gentle enough to put on my skin and easy to wash off. The Olive & Shea Moisturizing Wash comes with natural and organic ingredients to satisfy those who want safer ingredients in their products. The shea butter and olive oil are both certified organic. There were no added parabens and no formaldehyde donors. The moisturizing wash is safe for people with sensitive skin and for people who have trouble with harsh chemicals and artificial fragrances. 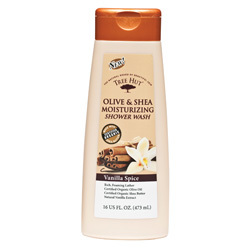 Tree Hut’s Olive & Shea Moisturizing Shower Wash-Vanilla Spice is the most useful shower wash I have ever used. It moisturized and cleaned my skin and left me smelling like soothing vanilla. It’s a shower wash that goes a long way in the end. For the price, the moisturizing wash is the best option for your needs. For those who wish to sample other scents in Tree Hut’s moisturizing wash line there are a wide variety of products to choose from such as: Almond and Honey, Brazilian Nut, Coconut Lime, Hawaiian Kukui, and Lavender and Chamomile.